The first Black United States Attorney General Eric Holder met with teenagers of the Brotherhood Crusade at their Crenshaw Blvd. location as part of his “Smart on Crime” tour on October 23. The outgoing Attorney General who announced his resignation, discussed solutions to police profiling and gained meaningful insight from the teens themselves on how the federal government can be a better advocate for them. 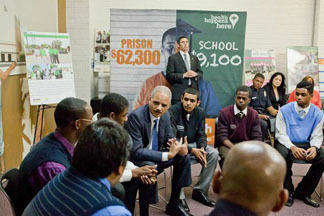 Holder sat in a roundtable format and engaged face to face with young men who are members of the Brotherhood Crusade’s various programs; the California Endowment sponsored the event. “I am here to listen to your concerns and listen to things that you are dealing with and suggestions you may have about how we can help, but most importantly I want to leave you with is the possibility to change and improve you life,” Holder stated. He then offered, “I have daughters so I still try to figure them out.” The teens laughed. In what began as honest and open dialog, there were moments of the serious nature of the visit. The national attention that was brought about in the police shooting death of Michael Brown in Ferguson, Mo hit right at home here in Southern California, which was reeling in the police shooting death of Ezel Ford. “What we’ve seen in Ferguson is nothing new to that community. They’re are things like that exist throughout and all around this country. The thing that I want you to understand is that at the end of the day, I am you1 I have experiences that are very similar to yours,” Holder candidly stated. Holder also has encountered circumstances while growing up of being profiled by police just because of the color of his skin. He vividly recalled a situation when police because of he stopped him was Black. However, now Holder stands in the prominent position to do something about it and thus his carefully arraigned tour is one that appears to be personally meaningful and professionally obligated. Los Angeles Police Department Assistant Chief Earl Paysinger who also participated in the discussion encouraged the teens to stay positive because they are the future. “There is an extraordinary amount of good in this community, and you are it. Each of you here today represents that. I often say to young people who are admitted into our LAPD programs that I am not the LAPD of the future, it’s you. You are it and to the extent that we can translate that message on a much more regular basis then we are headed in the right direction,” said Paysinger. Holder’s tour is expected to resonate with Black youths and teens throughout the nation and is sure to add to his closing legacy. He spoke the next day on October 24 in downtown Los Angeles at a ceremony for graduates of an experimental federal diversion program that aims to keep low-level offenders out of prison. The graduation was held at the downtown federal courthouse and afterward participated in a roundtable discussion with officials of the U.S. Attorney’s Office, is part of his “Smart on Crime” tour. Holder announced the initiative to increase the U.S. Department of Justice’s efforts to strengthen the criminal justice system, increase public safety and support sentencing reform across the board. The Brotherhood Crusade group consisted of Blacks, Latinos and a bisexual Asian and while much of the discussion centered on concerns they had with law enforcement, there were touching examples of how they can better relate to each other. Examples of peer pressure to join gangs and sell drugs against the positive notion of staying in school and gaining a meaningful education. Some had experience being victims of that peer pressure and endured the consequences, but have transform their life in a meaningful way thanks in large part to organizations such as the Brotherhood Crusade. The examples of what they could become sat right before them in the face of California Endowment CEO Robert Ross, Holder and Paysinger. Those are huge benchmarks for sure, but the aforementioned started where they are.